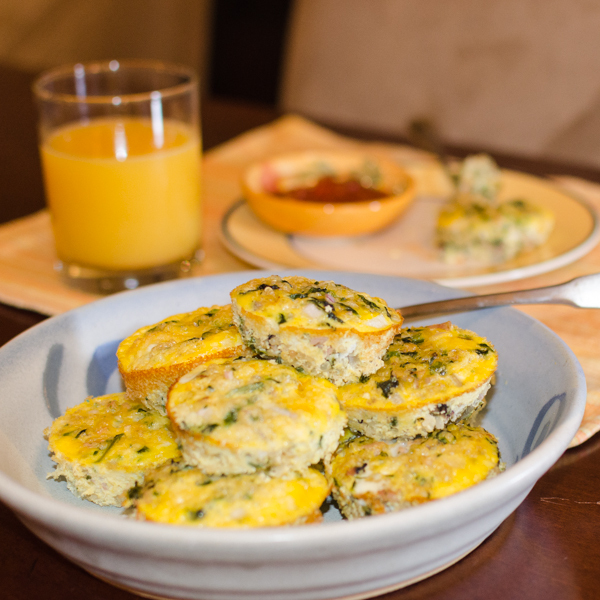 These little quinoa egg cups are actually quite filling. They have all the deliciousness of ham, eggs and cheddar, with spinach and quinoa to round them out. When I first made them, I had visions of tasty breakfasts for a full week. Not so much. They were gone in 2 days flat. That’s how delicious they are. If you came here via the google, you already know that this isn’t the only quinoa egg cup recipe that’s out there. The biggest difference between mine and the rest is that I cook the quinoa first, instead of using it for a crust. However, since quinoa as a crust sounded interesting, I did more experimenting later and came up with another quinoa breakfast recipe involving quinoa as a crust for a quiche. I’ve since carried this trend forward a little more and have a skillet version using red quinoa, eggs and sausage. It’s enough to feed six hungry people and all takes place in one cast iron pan. This recipe for quinoa egg cups makes just enough (18) to fill a regulation size cupcake pan. One thing to watch out for with muffin tin eggs is that they can stick in a ridiculous way. So use plenty of nonstick cooking spray! The big question is, can you freeze egg muffins? As with any dish that you freeze, the thawed version won’t be the same, but it is possible. Let the muffins cool completely so that they don’t sweat in the freezer. You’ll be able to reheat them later in the microwave. Add the quinoa, ham, onion, spinach and cheese to the bowl and fold in. I need these egg quinoa cups and a bloody mary stat! That sounds like a pretty awesome breakfast! Some hot sauce on the both egg cups and in the bloody mary, perhaps? Thanks for the follow-up, Crystal, so glad to hear they were a big hit! Regrets, I don't have any calculation on nutritional information. I'd estimate they are about 3-5 ounces each based on size and have about 1/3 of an egg on average (if you make 18).